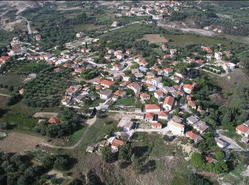 Mantzavinata is of the southernmost villages of Palliki and has 220 inhabitants. Along with the village Vouni, form the municipal district Katogi, as it is called the southern part of the peninsula (in contrast with “Anogi” which is the north). It is located just after the village Soullari, as you start from Lixouri to the South. Its name comes from the Italian words mangia (= food) and vino (= wine) that indicate the main occupation of the inhabitants of Mantzavinata, since the Venetian occupation: cultivation of grapes and production of wine and raisin. Close to Mantzavinata is Xi, one of the most famous beaches of Palliki: ruddy sand and wild landscape composes a unique setting that impresses the visitors. Even further south, is Kounopetra, which has occupied geologists and researchers for centuries. It is a stone, a rock in the sea, moving incessantly. Especially until 1953, the testimonies say that the movement was visible to the naked eye, and even today, with the help of the informational signs of the Cultural Association of Mantzavinata, one can observe it. Every August, takes place in the courtyard of the former school building in Mantzavinata, the wine’s festival of the cultural association “Kounopetra”, Mantzavinata – Vouni.